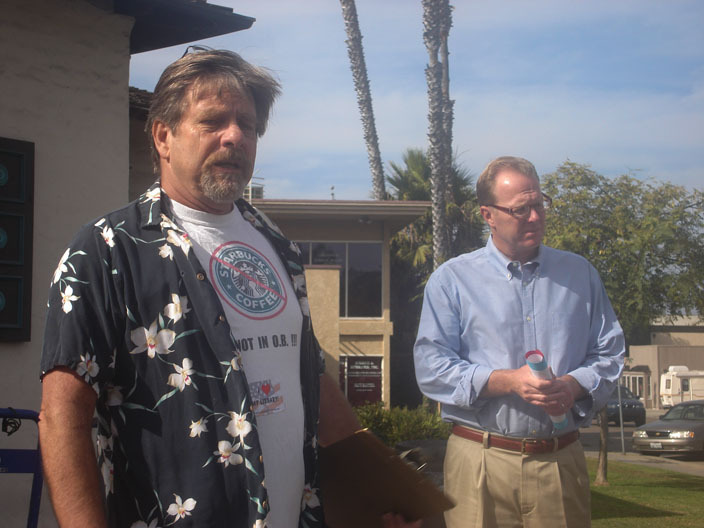 Councilman Kevin Faulconer at November 2008 rally to save the OB Library. Editor: Councilman Kevin Faulconer has sent the OB Rag the following note to explain his position on the Mayor’s proposed cut-backs, including libraries, rec centers, and fire pits. Frank asked me to put a few thoughts in writing so here I am. Please indulge me for a few moments. Mayor Jerry Sanders recently released his proposed budget for the upcoming fiscal year. His proposal contains good news – the fire engine brownouts are coming to an end. And bad news – cuts to libraries, rec centers and firepits. By the time the Mayor and the City Council finish deliberations this summer, I am confident you’re going to see a budget that preserves libraries, rec centers and firepits. I am working with leaders from the tourism industry and the San Diego Foundation on short- and long-term funding plans for the firepits. Those details should be finalized in the next few weeks. On a separate but equally important track, I am working to preserve our libraries and rec centers. I am exploring several options, and so are my City Council colleagues. Today, in fact, I sent a memo to the City’s COO inquiring about the installation of solar panels on city light poles, which could generate millions of dollars a year from the sale of clean energy to SDG&E. I hope all of you are well, and if you have any questions please email me kevinfaulconer@sandiego.gov or call 619.236.6622. I am happy Kevin is working on saving our firepits. They will help provide warmth for the thousands of workers who are losing their jobs and, subsequently, their homes thanks to the Demaio / Sanders / Faulconer economic policies at the City. Well thanks for speaking up, Kevin. I respect any efforts you put toward firepits, libraries, or parks & rec, even though I’m not going to be signing up for your fan club. Gosh Kevin I hope you can stand by a roaring fire in a fire pit and toast Carie Nation with a big glass of NON ALCOHOLIC beverage. I… suppose it’s just me that sees something. BTW, do the blinders they’re passing out come in purple? They are not up to anything. These are not the droids you are looking for…. Kevin hopefully will keep his word, not as a candidate for mayor but because it is the right thing to do, something often forgotten by both sides of the political aisle. Have a beautiful day in OB, a place I’ve lived in and loved. I’m pleased that Councilman Faulconer is so motivated towards saving our firepits and producing green electricity. What bothers me is his penchant for outsourcing City work to the private sector and to non-San Diegans. The outsourcing of computer services, road construction, and ambulances point to ideology and graft as more weighty than common sense in this regard. The protection of police and fire budgets at the expense of crime prevention (e.g., rec centers), esp. after we had a vivid demonstration the day of deceased officer Chris Wilson’s public-financed funeral when a massive diversion 0f police and fire personnel brought nothing close to anarchy and esp. given the $100,000 club of police officers whose duty is nothing akin to military service in Afghanistan, as we spend so much on frivolous construction (e.g., the pedestrian bridge across Pacific Coast Highway to PetPoop Stadium), smacks of class warfare and was conveniently ignored.